Matt Bors prides himself (perhaps reluctantly) on being “The Last” nationally-syndicated editorial cartoonist in the United States of America. While the rest of the “sequential arts” are in the midst of their own Comic Renaissance, political and editorial cartoons are withering away with printed newspapers—now used with more satisfaction for fireplace starter and nesting material for gerbils than reading. Web comic celebrity Matt Inman once put it a few years back, “With The Oatmeal, I wanted to create something where the viral marketing itself was the product, rather than trying to put it on something else.” I would argue that, er, Matt B. essentially does the same thing except with politicians instead of cats wearing ties (which does hurt his stats a little bit). In the realm of politics, though, Bors’ drawn conclusions are successfully competing with mainstream news media, (and they downright Haretsukan others in the domain of editorial cartooning). While the medium of the comic panels is almost defined by its accessibility, as Matt Inman hints at, the content of said panels remains a refreshing escape hatch from the suffocation usually associated with mainstream political discourse. It’s a pretty impressive balance. [ ] Despite being elected as the “anti-war candidate” against the GOP, Obama has continued the War on Terror, surged the troops in Afghanistan, NOT closed Guantanamo, and fully ushered in the era of drone-based warfare, currently occupying half a dozen countries in the Middle East / Central Asia. [ ] Millenials, as a generation, aren’t “lazy”: they’re fucked (link goes to this gem of an essay, included in Matt’s book, posted on Matt’s website). 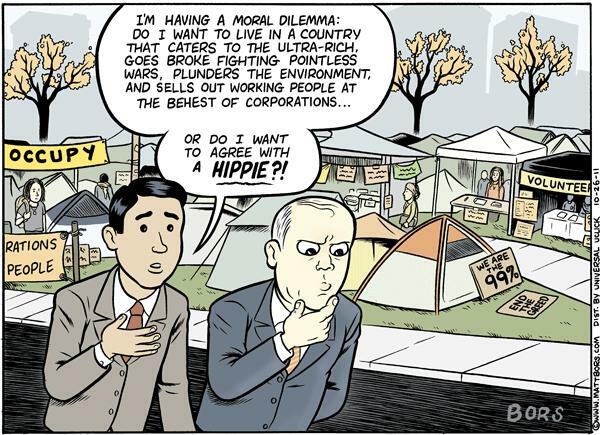 [ ] Occupy wasn’t a bunch of hippies sitting in a drum circle, and “I am the 99%” wasn’t just an incredibly meaningful slogan thought up in between bong hits. The book is Matt in 200 pages. It’s everything that he offers as a political cartoonist in both form and content. It’s editorial cartoons and comics journalism, satire and commentary, covering women’s rights, marriage equality, Iraq, Afghanistan, Guantanamo, gun control, elections, debates and popular [mis]conceptions about all of these things. It’s a powerful and enjoyable showcase that makes you wonder why NO ONE else is doing it like Matt is doing it. Matt made fun of me, more or less, when I described him like that before–I guess I just don’t know how else to say it. Is there anything I disagree with Matt on? 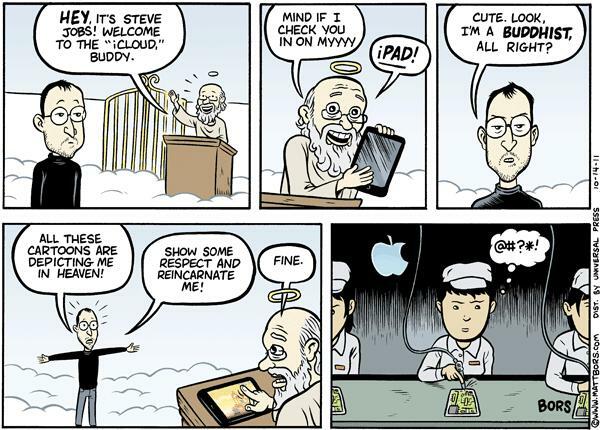 One cartoon not doing it for me, out of a thousand, is acceptable. 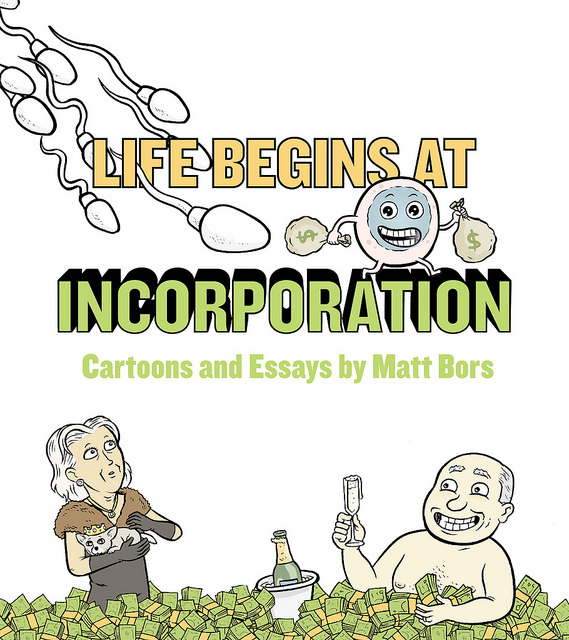 Matt’s book, Life Begins at Incorporation, can be purchased online through Matt’s website. If you’re like me and live in Toronto, you can find it through the Ad Astra Comix Distro, The Beguiling, The Comic Book Lounge, Hairy Tarantula, and The Silver Snail.